A remarkable result of our astronomical study (read our new interdisciplinary research paper on ResearchGate) is that the postulated astronomical/historical error (232 years) appears to be offset by 14 years from the dendrochronological error (218 years) found in a previous study (read here). This means that, if we are right, then all current dendrochronological dates within the Roman time complex are given 14 years too young. According to our interpretation, the 14 years offset is caused by an improper synchronization of the Roman dendro complex towards Roman history. During the 1960's, oak chronologies covering several hundred years from the Iron Age and in particular the Roman period were established, but it took several years to link these chronologies to the absolute tree-ring calendar because the sparse building activity during the 4th century A.D. left behind very few wooden remains. Furthermore, that period was affected by such an unfavourable climate that relatively few oaks from the river plains or valley slopes became imbedded in the gravel formations, so that even the tree remains that might be found could not be counted on to fill in the gaps in the chronology. To localise the tree-ring chronology of the Roman period, archaeologists thought they could use as a fixed referenee point the wooden remains of the first bridge over the Rhine in Cologne, a bridge whose construction was set at 310 A.D. on the basis of references in ancient texts. Thus the youngest tree ring from these bridge piles was attributed to the year 310 A.D., and the Roman tree-ring chronology was considered to be 'nearly exactly dated'. Anomalies existed, however, as was pointed out for example by BAATZ (1977). Basing his arguments on three objects which were weIl dated both archaeologically and dendrochronologically, he concluded that the archaeological-historical datas were set at 30 to 70 years too old in comparison with the dendrochronological results. In the light of such observations we were led to study the wooden remains from the Roman camp at Oberaden and found they could be dated with certainty within the Roman period tree-ring chronology of the Cologne laboratory, which was based on the tree-ring curve "Wederath" of HOLLSTEIN (1972). According to our results, the Roman camp was built around 38 A.D., a date which was, however, totally unacceptable to the archaeologists. Numismatical and other archaeological evidence places the occupation of this Roman camp in the period from 12 to 9 or 8 B.C. Accordingly we proposed shifting the previously used Roman period chronology from 38 B.C. to 11 + 5 B.C., that is, by 27 + 5 years towards the present (SCHMIDT, SCHWABEDISSEN 1978). In the meantime HOLLSTEIN had analysed further finds of wood and had filled in the last remaining gaps in his chronology. In doing so he confirmed the correction factor of 27 years (HOLLSTEIN 1977, 1979). 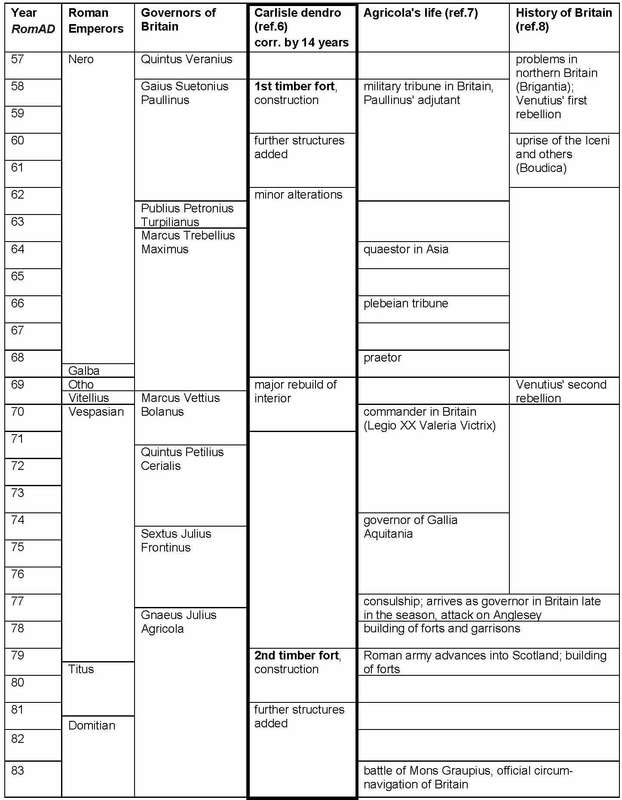 One year later HOLLSTEIN (1980) presented a complete treering calendar extending from 724 B.C. which did not rely on any archaeologically based consideration. Ernst Hollstein (ref.2, p.10) tells a similar story in German (though with a correction by 26 years). However, we have found no significant and trustable dendrochronological bridge between Roman time and early Medieval time in Hollstein's published data. Therefore the claim that Hollstein's tree-ring calendar is free from archaeologically based considerations is plainly invalid. Moreover, the Oberaden raw data is still unpublished. The almost incredible fact is that, though since 1984 (ref.3) all long European oak chronologies are synchronized exactly to the year, no significant bridge between Roman time and early Medieval time has ever been published for any of them. However, all dendro labs claim that they worked independently of each other and of historical considerations. Hollstein himself noted that there is something wrong with the final "calibration" of the Roman dendro complex, and he asked for an acceptable interpretation. First he complained about the above mentioned bridge over the Rhine in Cologne which with the final calibration of the Roman complex got the building date 336, though it is mentioned in a panegyric for Constantine the Great already in RomAD 310. Hollstein also complained about the bridge over the Moselle in Trier which got a safe dendrochronological felling year of 71 within the Roman complex for one of the large foundation pillars (though the "uncorrected" year 45 is still commonly seen e.g. on the Internet). However, that bridge played a role already during the Batavian uprise RomAD 70 as narrated by Tacitus (ref.4) and the bridge was therefore certainly completed before that year. The centre of their line was assigned to the Ubii and Lingones; on the right wing were the Batavian cohorts, on the left the Bructeri and the Tencteri. These rushed forward, some by the hills, others between the road and the Moselle, so rapidly that Cerialis was in his chamber and bed — for he had not passed the night in camp — when at the same moment he received the report that his troops were engaged and were being beaten. He kept on abusing the messengers for their alarm until the whole disaster was before his eyes: the enemy had broken into the legions' camp, had routed the cavalry, and had occupied the middle of the bridge over the Moselle, which connects the remoter quarters with the colony. Undismayed in this crisis, Cerialis stopped the fugitives with his own hand, and, although quite unprotected, exposed himself to the enemy's fire; then by his good fortune and rash courage, aided by the bravest of his troops who rushed to his assistance, he recovered the bridge and held it with a picked force. With our dendrochronological offset of 14 years the felling year for the large foundation pillar becomes RomAD 57. This is 13 years before the fight on the Moselle bridge during the Batavian uprise in RomAD 70. Indeed a nice, simple and acceptable interpretation. The calculation for the Rhine bridge is not that easy as we suspect a dendrochronological error in the tree-ring sequence. Annetwell Street, Carlisle. Dating in the historic period can be illustrated by the results from the complex urban site of Annetwell Street in Carlisle. Excavations at Carlisle have revealed the remains of many Roman military and civic structures. Dendrochronology has been important in providing a detailed independent chronological framework for the development of this town on the north-west frontier of the Roman Empire in the first century AD. Before the study, dating evidence relied on coins, pottery, and the writings of Tacitus, in particular his work on the life of his father-in-law Agricola.These had been interpreted to indicate that the first fort was constructed in AD 79 (Caruana 1990; McCarthy et al 1989). Over 500 oak samples were examined from the Annetwell Street excavations by Cathy Groves (forthcoming (b)).There were numerous samples with more than 200 rings and these provided a basic chronology for the site. Many of the other samples were small, no more than 50 – 100mm across, but they were narrow ringed and often had bark edge thus providing precise dates.The analysis indicated that the timbers were local; they seem to have been used soon after felling although reuse of timber was sometimes detected. The first wooden fort was constructed from timbers felled in the winter/early spring of AD 72/73. Modifications were made to the fort throughout the period AD 72 – 82, and there was a major rebuild of the interior in AD 83 – 5.There was no detectable felling of timber during AD 86 – 92, a period which coincides with a major reorganisation of forces within the Roman Empire. More timbers were felled in AD 93/94 with a few felled during AD 95 – 7. The surrounding rampart shows a similar development to that of the fort. It was constructed in AD 72/73, repaired in AD 84/85, and finally rebuilt in AD 93/94. After this, stone replaced timber as a building material and dendrochronology ceases to be useful. The results outlined above are likely to change the historical interpretation of the development of the Roman northwest frontier in Britain during the first century AD. They also confirm that the writings of Tacitus are not always reliable. His date of AD 79 for the founding of Carlisle coincides with the time when his father-in-law Agricola was governor of Britain whereas it is now clear from dendrochronology that Carlisle was in fact founded under Petillius Cerialis some six or seven years earlier. It has long been suspected that Tacitus was economical with the truth so as to improve the image of Agricola (Birley 1973; Caruana 1990). Now that this theory has been confirmed by dendrochronology, the use of the term ‘Agricolan’ in British history and archaeology will have to be revised. According to our interpretation, the second timber fort is the one built by Agricola in RomAD 79 exactly as stated by Tacitus. However, the erection of the first timber fort seems to be related to upheaval in Brigantia in northern Britain. A fort in Carlisle allowed the Romans to be in place and control what was going on. Also the major rebuild of the interior of the fort in RomAD 69/70 appears to be related to trouble in Brigantia. As we have three distinct dendrochronological dates in Carlisle within a time range of 21 years, we can use these dates to validate our postulated synchronization error between dendrochronological and historical dating of Roman time. When the 14 years offset is corrected, the archaeological results now comply with the historical timings. This further strengthens our hypothesis from which we originally derived the size of the offset. 1. Schmidt B., Dating of Roman sites. In: Dendrochronology and Archaeology in Europe: Proceedings of a Workshop of the European Science Foundation (ESF), held in Hamburg, April 28-30, 1982. Vol.141 of Bundesforschungsanstalt für Forst- und Holzwirtschaft Hamburg: Mitteilungen der Bundesforschungsanstalt für Forst- und Holzwirtschaft, Hamburg. 2. Hollstein, E. Mitteleuropäische Eichenchronologie. Verlag Philipp von Zabern, Mainz am Rhein 1980. 3. Pilcher, J.R., Baillie, M.G.L., Schmidt, B. and Becker, B., 1984. A 7,272-year tree-ring chronology for western Europe. Nature 312 (5990), 150-152. 8. Shotter D. (1999). Cerialis, Agricola and the Conquest of Northern Britain. Contrebis vol.XXIV, p.3-8. * Hoffmann, B. 2013. The Roman Invasion of Britain: Archaeology Versus History. Pen & Sword. Preview, read here.